BACKGROUND & AIMS: Johansson, Aronson & Lindström were asked by the owners of a highly-mechanised sawmill in Sweden to investigate the relationship between levels of occupational stress and productivity. The company was specifically interested in whether stress levels could be reduced and productivity increased. As part of this, the researchers wanted to compare the psychological and physiological stress responses in 2 different categories of workers. PROCEDURE (METHOD): It was a natural experiment, using an independent groups design, as the workers were already in their 2 work categories so there was no manipulation of this variable. After preliminary observations, one group of skilled workers was seen to be particularly vulnerable to occupational stress: 14 workers responsible for transforming planed timber into a finished product The rate at which they worked determined the overall pay of everyone on their production line. The work was repetitive but complex and required a great deal of knowledge and continual attention; it was machine-paced, thus providing little control of pace or work routine. Additionally, these finishers were physically constrained and worked in social isolation. 10 workers who did maintenance or were cleaners and worked under more flexible conditions were used as a control group. Each participant was asked to give a daily urine sample and at 4 other times each day. The baseline measurements were taken at the same time each day (when the workers were at home). 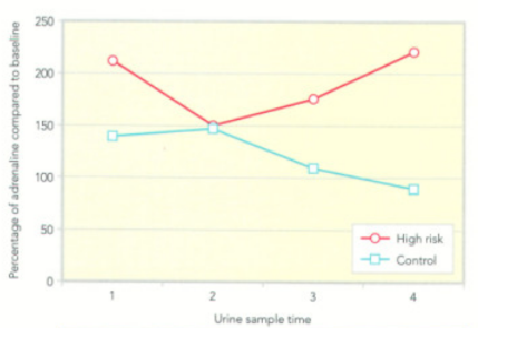 The researchers tested the urine for adrenaline and noradrealine as measures of sympathetic arousal. Body temperature was measured at the time of the urine collection. The participants also completed self-rating scales on words such as ‘sleepiness’, ‘well-being’, ‘irritation’ and ‘efficiency’ -the scale going from ‘zero’ to ‘maximal’ (the highest level the person had ever experienced). They were also required to report caffeine and nicotine consumption. Additionally, the researchers examined records of illness and absence. They then reported these findings back to the factory management. FINDINGS (RESULTS): In the first urine samples of the day -see chart left-the finishers had adrenaline twice as high as their baselines and these continued to rise overall after some drop. In comparison, the control group had a peak level of 1.5 x their baselines in the morning and this declined during the rest of their shift. The finishers showed higher levels on work days than rest days. In the self-report, the finishers felt more rushed and irritated than the control group. They also rated their well-being as lower than that of the control group. The finishers had higher rates of absenteeism than the control group and more psychosomatic illness such as hypertension. over the pace at which they worked. Occupational stress was consequently reduced and workers recorded higher levels of job satisfaction. Thus, the study can be said to have high applicability. As these were real workers doing their daily jobs, the study is high in mundane realism and ecological validity. As there were multiple variables affecting the reporting of stress and possibly the sickness and absenteeism amongs the finishers, Johansson, Aronson & Lindström could only assign correlations to the variables and not cause-and-effect. Self-reporting measures are, as always, vulnerable to social desirability bias and other forms of distortion. However, the hard biological measures the researchers took help to confirm the results of the self-reporting. As the study was conducted only on Swedish men, it can be criticised for potential cultural bias and gender bias.